Situated in the popular Kings Drive area with magical mountain views and some lake views as well, this 2 storey home has 3 bedrooms, 2 bathrooms and a large deck. Just a short walk to the lovely Bremner Bay, sports fields, Wanaka township, cafes and only 1km from the lake front. Upstairs features the sunny open plan living, dining and well-equipped kitchen area with a large deck. The property has modern appliances, gas cooking, dishwasher etc. Safety gates are provided for toddlers at the top of stairs indoors and on the deck. The Master bedroom and ensuite are on the upper level and open up to the deck area. Downstairs has the remaining 2 bedrooms, large laundry/playroom with sofa bed and bathroom with bath. Both bedrooms have oil heaters and sliding doors to outside. Ski storage with boot drier can accommodate 6 pairs of boots. A popular choice for your Wanaka holiday. Great location close to Bremner Bay and sports fields. Heat pump upstairs, oil heaters in rooms downstairs. Well located, lovely views, comfortable beds and had everything we needed. Perfect bach for ski holiday! We took our son and 2 of his friends down to Wanaka for a snowboarding holiday. The bach was perfect in every way. The house is very clean, dry and warm and has everything you would require for a winter holiday - including a bonus of beautiful snow capped mountain views. The house is split over 2 levels and has 2 'living' areas - which was convenient when the teenage boys wanted their own space. 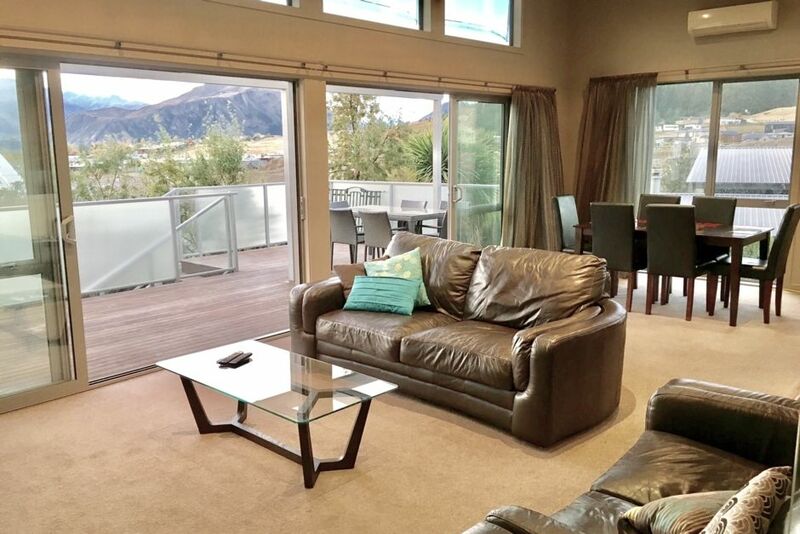 Being in Wanaka, you are located conveniently close to both Treble Cone and Cardrona. Would happily stay there again and we can highly recommend this rental. House was very well appointed and very clean. Property is a great set up. Property is a great set up. It's clean, tidy and offers amazing views! We were two small families and it worked great for us. Would totally stay again!